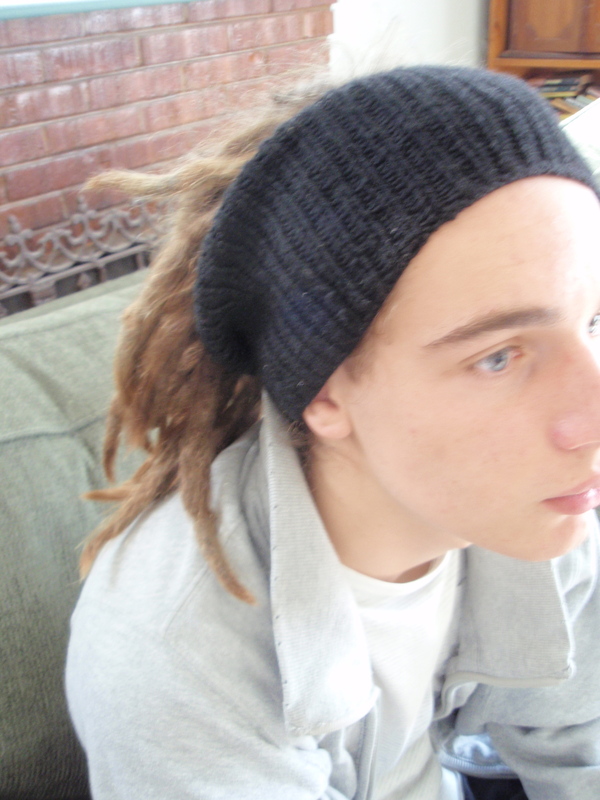 Black headband to hold back dreadlocks. Blogged here, along with the link to the patterns. This was very quick and easy to make… I can highly recommend it. Edited at add: I made another one for a friend. 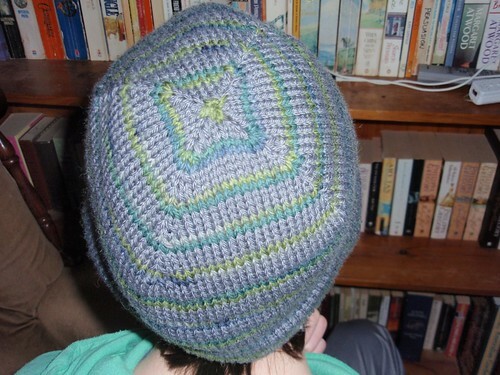 Second go at this pattern… again a raging success! 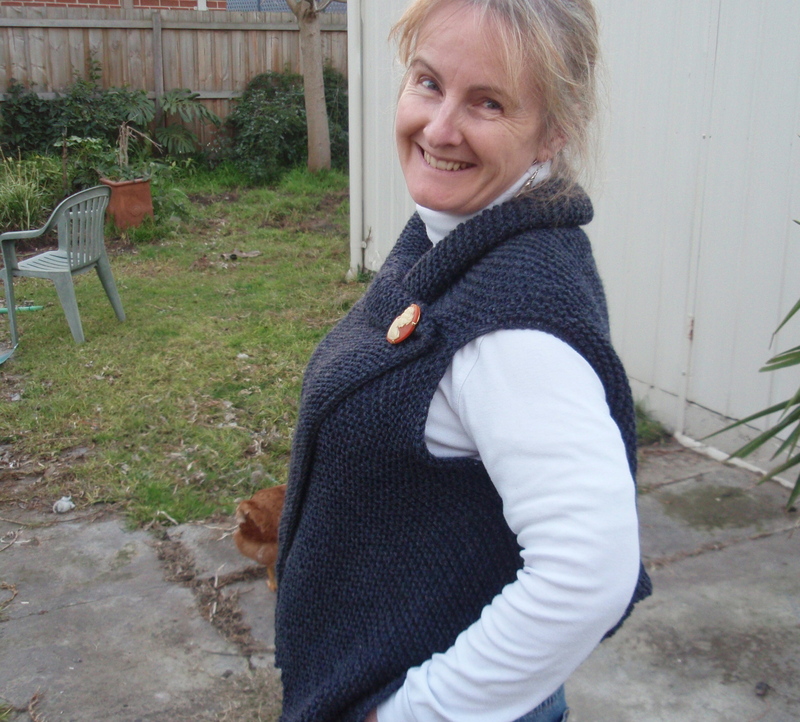 Blogged here with links to the pattern and the Ravelry page. Very happy with this one. It’s not often I make a top big enough for me to wear, so I’m relieved that I like it! I’ve been wanting to knit this one for years. Very glad I got around to it now that the yarn has been discontinued. Blogged here, with a lot more photos. This scarf only took 2.5 days to make, and because it is 7 rings with a solid piece at the back to hold it all together, it’s an interesting knit as well. Love it! Made with one skein of hand dyed wool, so it’s a good little stash buster as well. Ravelised here, also with lots of photos. Free pattern on Ravelry, found here. These gloves are a Christmas present for my 15 year old son. 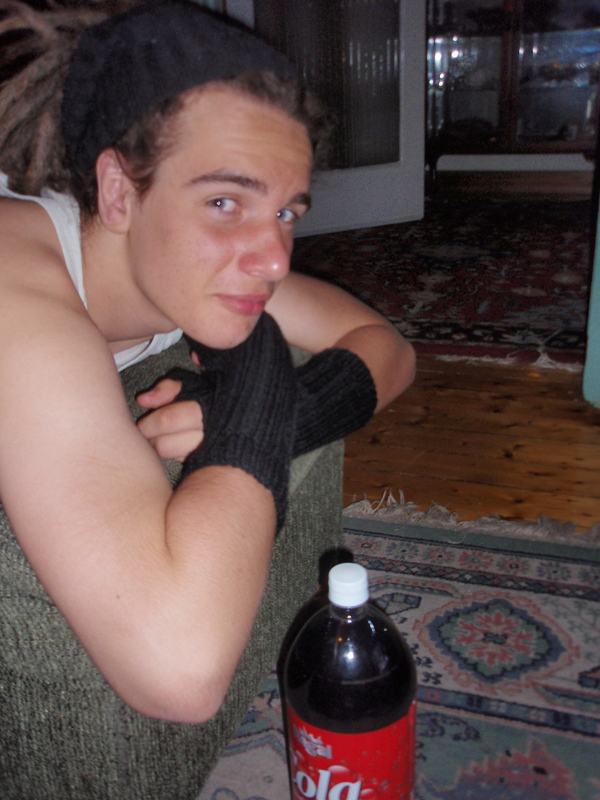 He requested fingerless gloves right up the entire length of his arms in black. We compromised on the colour, because I had a huge ball of brown wool in the stash. I can highly recommend the pattern… it’s free on Ravelry and my second son (the 16 year old) has requested a pair for himself… thankfully in a more usual length. 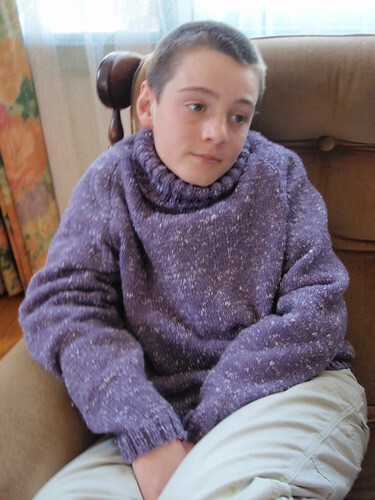 Any handknits that teenage boys like to wear is a winner in my book! Very happy with these gloves. 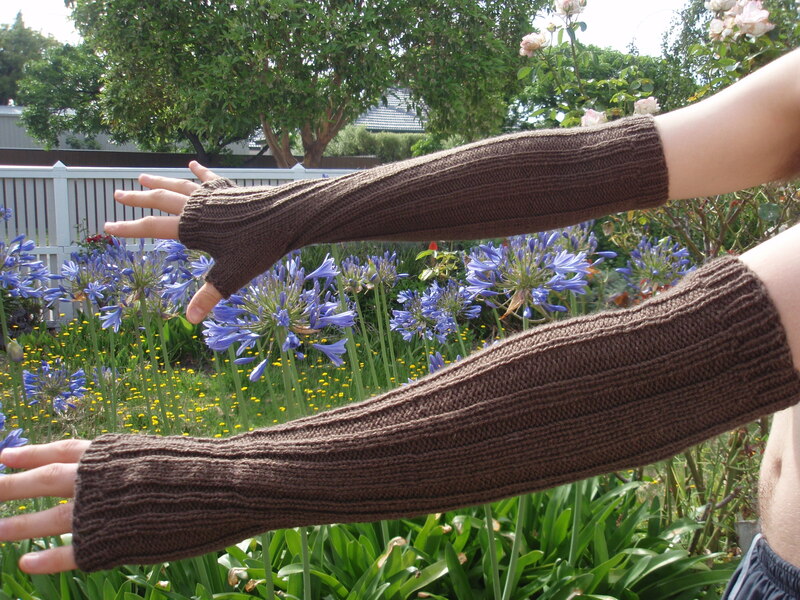 Ryan3 wants me to make him a pair of fingerless gloves after seeing these, but he wants them in a more manly style. Apparently cables around the cuffs are slightly ‘girly’. 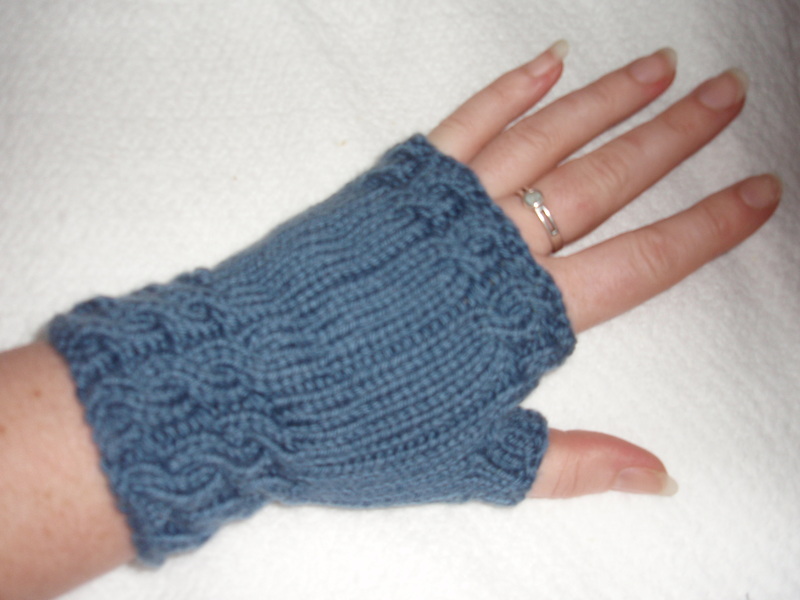 Still, I count these gloves as a success if they inspire my teenagers to request hand knits! 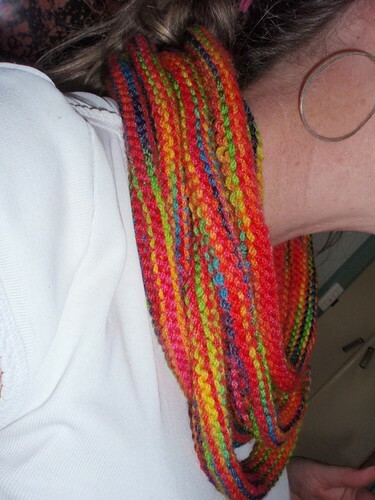 Basketweave Scarf. My own pattern. I fell in love with this yarn (Jo Sharps Silkroad DK Tweed) and had to buy it. This scarf has a lovely drape, probably due to the silk in the yarn. Ravelised here, with the pattern. It isn’t hard to do, but it takes a little time because the needles are fairly small. 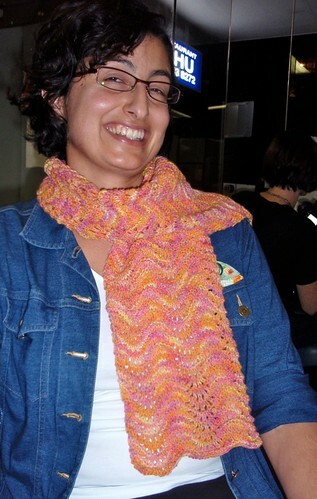 But you could make this scarf with any ply wool, and the result is worth it. Very classic. And slimming. Blogged here, with a load more pictures to really show it off, along with the shockingly neglected back garden. Ravelised here. No photo as yet… I sent it off to the recipient without getting the camera out. Not one of my finest blogging moments. But I can HIGHLY recommend the pattern. 27/09/09 Oh my goodness… how I’ve neglected this page! 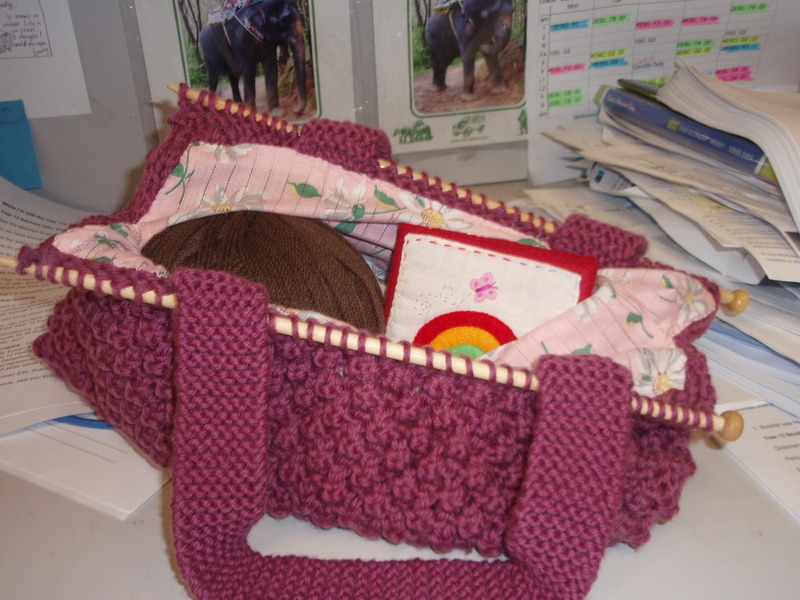 I update the books and the quilts, but even though I always have something on the knitting needles… I never post them. I’ll do a bit of a catch up. Four ‘Turn a Square’ beanies for my four boys. Pattern found here. 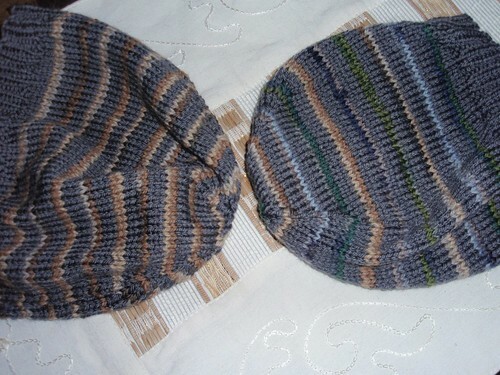 These beanies were easy to make and very rewarding… knitters with teenage boys know that when they grab something as soon as it’s off the needles and wear it willingly, then you’re onto a winner. I want to knit one for me, but in something slightly more girly than steely grey. Knitted with Rowan Cashsoft 8 ply for the grey and Cleckheaton Country Prints for the stripes. 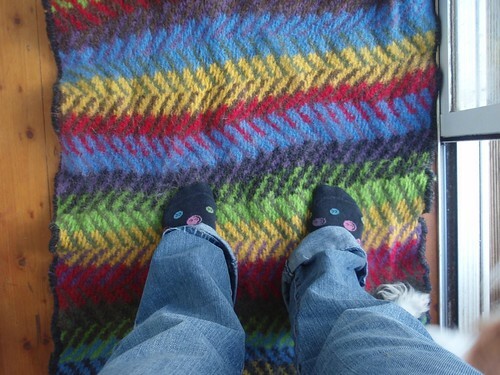 Mostly, these things are what I’ve been knitting. Ever since the child support went down to $3 a day per child, I’ve been knitting baby hats and snake scarves to sell so that Ryan3 can keep doing guitar. As soon as one is off the needles another one is on, so it’s a never ending stream of DPNs and 4 ply wool. However, I’m getting very sick of knitting nothing but baby hats, so I’ve decided that this coming year I’ll alternate between something for us and something to sell. This photo blogged here. Don’t laugh, but I’ve also been knitting myself some dishcloths for the kitchen. I am in love with them. Knitted with pure cotton, you can throw them into the wash with anything, they dry in a snap and when they eventually get worn out, you can throw them into the compost because there’s no artificial fibres in them. I experimented with different stitches, but for simple scrubbiness with dirty pots I love the garter stitch ones. 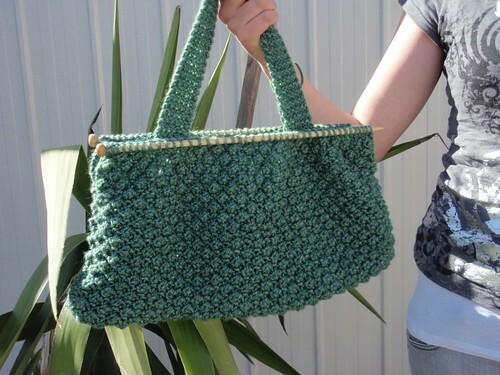 Great for mindless knitting in front of the tv when you’re tired. Just cast on however many stitches you think you’ll need. From memory, I think I cast on around 44. 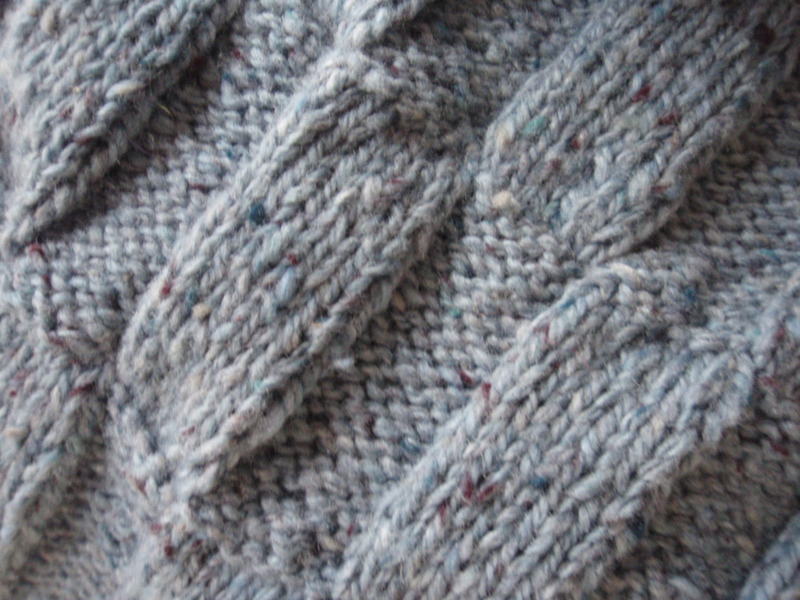 Then knit a square or rectangle big enough to cover your hand. Then cast off. 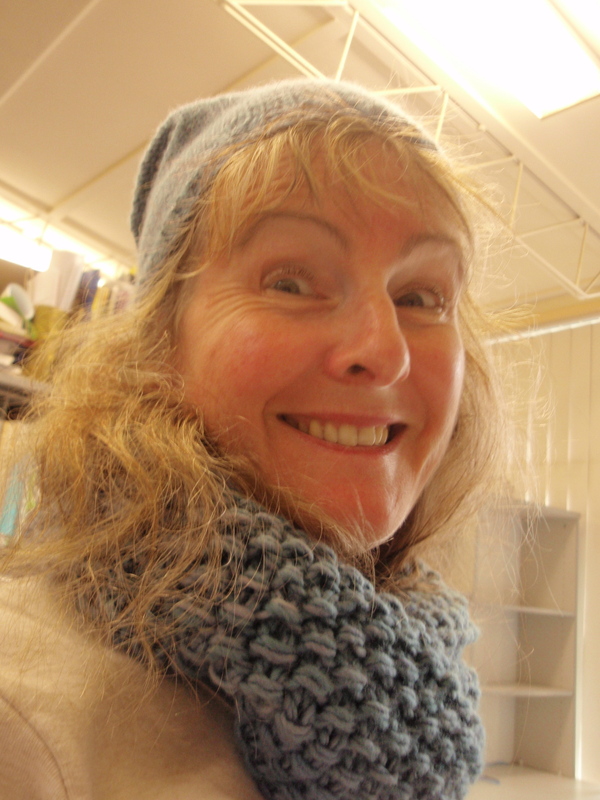 A feather and fan scarf, modelled by the lovely Eleanor and gifted to Mary from Sydney. Pattern found here. The enormous 8 ply afghan. This took 63.75 hours over 3.5 months to do. (I’m not normally so attentive to the stats, but I had a lot of time to wonder just how long this project was going to take.) Knitted in basket weave, so no sewing!!! I needed a bit of a change, so now I’m working with this: to make these: Finished 1/03/08 I hate knitting socks, I’ve decided. Made for me but Evan4 is modeling it. 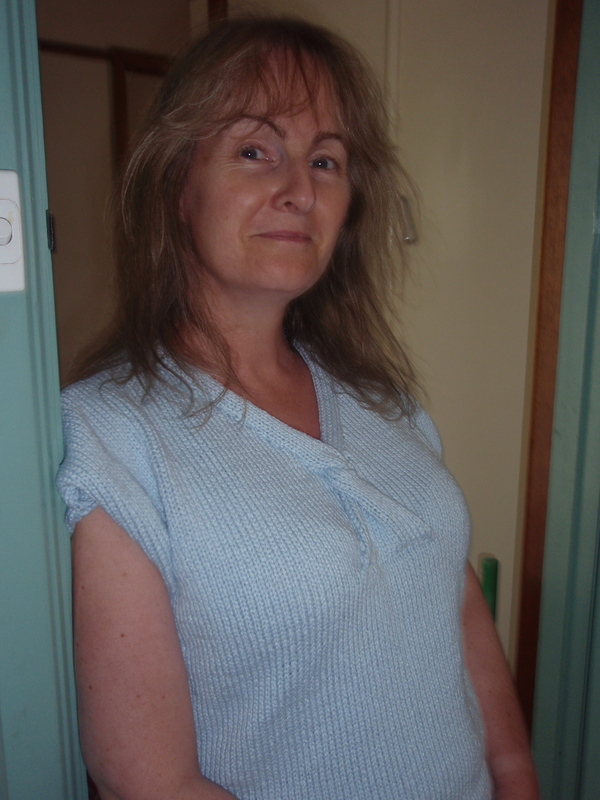 Finished 30/03/08 This jumper drapes so well and is so very comfortable. The wool is expensive but well worth it.